A very interesting MVNO launch recently has been the launch of Samuel Eto'o Fils is to launch his own MVNO in his home country Cameroon. So far so good. Like with any MVNO, there are still pitfalls and the above are by no means a guaranteed recipe for success, however we start well, which is important. The market wants more innovation, mobile payments got Africa off to a flying start, but a lack of dynamic vehicles is slowing it down. Once MNOs have got over the shock of MVNOs (usually about the time they see the amount of almost 100% EBITDA positive revenue they generate) they are also a fantastic platform for innovation that does not entrench the market where each operator mimics the other no matter what (GPRS, SMS, PTC, etc). That is, an MVNO in the states could have launched push to talk and would not have caused a de facto push of all MNOs to PTC, as it did with Nextel launching PTC: all that money later, where is PTC now??? Consumers tend to grow stronger and more loyal followings than brands, and they do not tend to go out of fashion as soon as other brands do. Personalities tend to cross borders better than clubs, which at the end of the day are more "national". there is therefore more opportunity to export both the model and the brand itself. people tend not to have a conflict: where a club may be sponsored or have links with an operator, a personal brand is seen as a "free agent". However, having said this, the brand is important - it should be an inclusive brand. Eto'o does not spark a controversy or an objection; controversy may sell initially, but it does not expand well, nor attract the golden feature of any MVNO: loyalty. 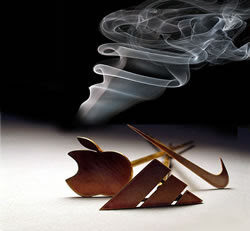 you also do not want a brand that even the most loyal fan may feel ashamed of or want to keep quiet at any moment. That is, with a club phone, you do not want it to ring when you are in a bar watching a game with a bunch of supporters from another team, or when you have beaten someone away... a player does not have that "exclusion". Getting the right deals and partners: the MNO, MVNE and other contracts should not have the usual clauses that make it difficult for the MVNO to be traded, sold or floated or even ported, should it become too big or too different to what was expected and no longer fit either parties strategic needs. This is the case for any MVNO, but more so with ones like this which are firsts, and the unknowns are huge: this could easily attract 1 million or more of the Cameroon population, or could only have 50,000 subs after 3 years, even then, the spend, type of usage, handset preference and many more unknowns mean that any/all of the parties may outgrow or be outgrown by the product. I shall be adding more in the coming months and pasting updates vai the Virtuser Google+ and Virtuser Facebook pages, so please like us on Facebook and +1 us if you have found this article interesting, useful or helpful.